Click chart for more market data. Investors said goodbye to a brutal August, the cruelest month for stocks during an otherwise sunny 2013. 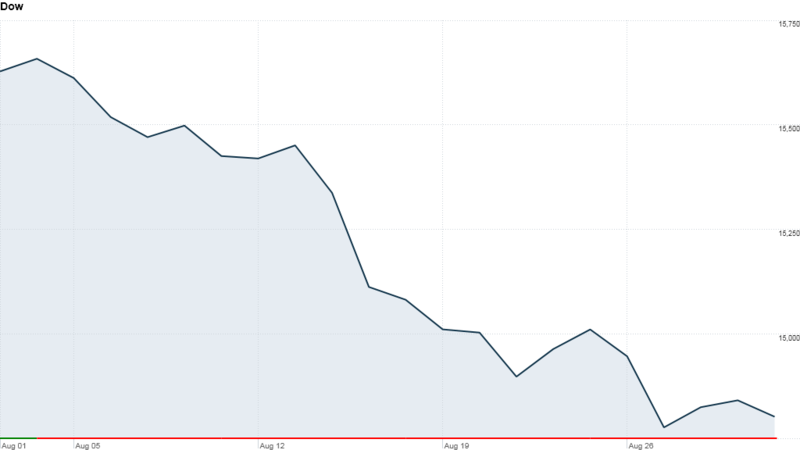 The Dow Jones Industrial Average and the S&P 500 lost between 3% and 4.5% this month. But they are still up between 13% and 15% for the year. The Nasdaq held up better in August, dropping only 1%. The tech-heavy index has gained nearly 19% year-to-date. Speculation that the Federal Reserve may cut back on, or taper, its monthly bond purchases as soon as September has made investors nervous. August has been painful outside of the U.S. too -- and particularly for emerging markets. India's Sensex and Mexico's Bolsa both lost nearly 4% in August. Brazil's Bovespa index moved up nearly 4% but trading has been extremely volatile. The Fed tapering talk has caused foreign investors to flee emerging markets. Japan's Nikkei index and Britain's FTSE index are both down roughly 2% in August. China has been a rare bright spot on the global landscape. The Shanghai Composite was up 5% in August, while the tech-heavy Shenzhen index (kind of like China's Nasdaq) rose nearly 6%. All three U.S. stock indexes closed lower Friday and ended the week down nearly 2%. Volume was been low all week, which is typical for late August. The U.S. markets will be closed Monday for Labor Day. Investors kept a close eye on the Middle East. The threat of a U.S.-led military strike on Syria dominated the headlines earlier this week, pushing stocks lower and oil and gold higher. Actions on Syria do not appear imminent, but investors are watching the situation closely. On Friday afternoon, President Obama said the U.S. is considering a wide range of possible options. What's moving: Salesforce.com (CRM)shares shot up after the cloud-based software company reported better-than-expected quarterly sales and earnings Thursday afternoon. Most StockTwits traders were happy to be on the right side of the Salesforce bet, i.e. not shorting the stock. 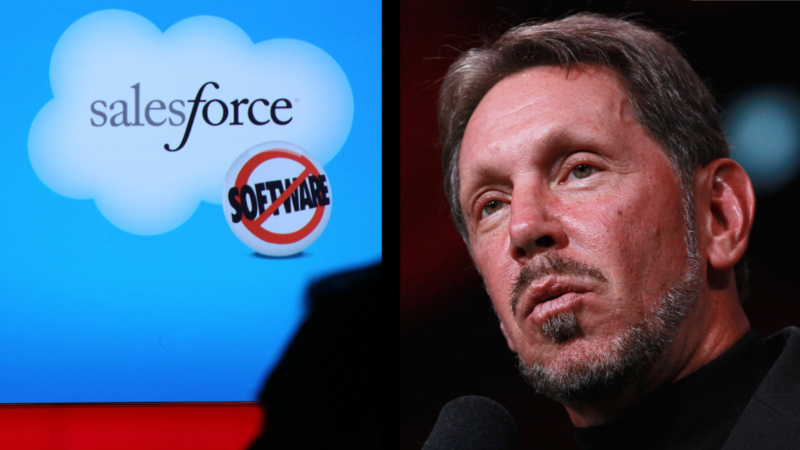 investorsmosaic: Very glad that my rule of never shorting $CRM is in effect in perpetuity. Despite it's insanely high valuation. Killed by the cronut? Krispy Kreme (KKD) shares dove 15% after the doughnut maker missed earnings estimates and lowered its full-year guidance Thursday. Still the stock has more than doubled in 2013. Some traders on StockTwits remain optimistic about Krispy Kreme. SPEWHEFNER: $KKD will be fine. Earnings were not that bad. Blame analysts for setting higher than necessary expectations. I see this bouncing back. nickndfl: $KKD I like the original glazed. Good stores in Daytona and Ft. Lauderdale. Just watching the stock go lean. Shares of energy producer Apache (APA) soared after it announced it was selling a 33% stake of its oil and gas holdings in Egypt to China's Sinopec (SHI) for $3.1 billion. Traders on StockTwits liked everything about the deal. teddyballgame: $APA finally doing the right thing and spreading some Egyptian risk to China. About time!